NOW CELEBRATING OUR 22ND ANNIVERSARY ! 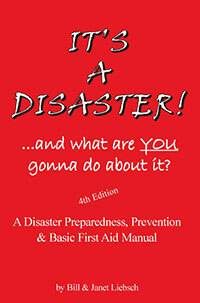 One of the premier manuals on disaster preparedness and survival, "It's A Disaster...and What are YOU Gonna Do About It?" is an easy to read, and reference, book used by many homeland security organizations in the Nation. Is 284 pages and offered here at a steep discount from the $14.99 plus shipping retail cost of this important and useful book to save your life! These books can, in quantity, be customized for your needs and is used by government protective service organizations, corporations, and others to provide their own unique and additional information or to have advertisements within the book for promotion or to help defray the very modest cost of them. For individuals and Corporations, this also makes a great gift or employee benefit item. This product line strives to provide a family of four (4) with all of their non-food disaster survival needs for a period of fourteen (14) days. Listings of food items to stock are also provided. The Survival Box (TM) product line comes in the Standard Box and Deluxe Supplement Box versions. Addtionally, optional geiger counter and dosimeter equipment is also available for purchase. NOTE: Due to we presently ramping up production of this first-of-its-kind product, this product is NOT offered for individual sale. Minimum order quantities are 300 Units (or combination of items) and therefore would generally be purchased by corporations and government entities such as police, fire, and homeland security departments. Arnold Business Enterprises (ABE), now in our 22nd year of business, stands ready to service your general business, human resource management, and product needs in a forthright, professional manner! We wish to demonstrate to you our confidence that once you try – you’ll specify – ABE for all your future business needs in our focus areas.